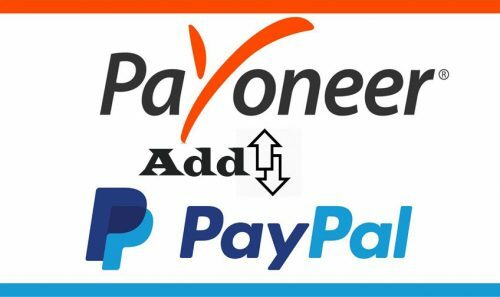 Add Payoneer Bank Account to PayPal. Payoneer has been very popular around the globe because of the fact that you cannot withdraw your PayPal funds in Nigeria. PayPal account in Nigeria can only be credited by any means but the funds cannot be withdrawn. This does not mean that the funds cannot be used online, it only cannot be withdrawn. there is now a legal way to withdraw your PayPal funds using Payoneer. PayPal is very different from Payoneer because it allows all users to send, receive, spend and transfer funds. They also give a debit card as PayPal does. For this reason, Nigerians have seen Payoneer a better choice for transferring funds online than PayPal. add Payoneer bank acount to PayPal is one of the many ways that you can withdraw your PayPal funds. PayPal can be seen as an online bank that promotes international business. It has a certain level of requirements that allows a bank to be added to one of its transfer lists. The only fault Nigerians found in PayPal so far is that they do not allow Nigerians to withdraw their funds. This could be because of certain reasons. It could also be because they think Nigerians are scamers, so they do not allow them to withdraw. The Payoneer is very similar to PayPal because it performs most of the functions that PayPal performs. The Payoneer platform is also secured with its own security techniques. Payoneer can be used in any country and from anywhere in the world. Add Payoneer bank account to PayPal allows you to open a US bank account for receiving funds from delegates overseas. the first step to begin is opening a paypal account. Follow these steps to open a PayPal account. Navigate to www.paypal.com using any web browser of your choice. Click on the “open a PayPal business account” link below the sign up button. Input your gmail address and continue. Fill in all vital information about your business on the new webpage. Agree to the terms and conditions and click on “Agree and continue”. Repeat the same step for the other forms and finish your sign up. Once you successfully complete the steps, you would be logged in to your new PayPal account. First, you have to get access to a good data connection to continue with this process. Click the sign-up link you would find on the webpage. Fill the form you would be redirected to with your personal data like your name and email address. after that click on continue. on the new page, you would be directed to, fill the form with your contact details and click on continue. You would now be required to key in personal and security information to help make your account secure. you would also be requested to add the number on your identity card. Once this is done, click on continue. agree to the terms and conditions and finish your account set up. This process is easy but may some time to complete. Apply for the Payoneer US payment service (this card would allow you to receive payments from US organizations). Go to the page that hosts the US payment service from Payoneer. Now, you choose existing customer if you already have a Payoneer prepaid account. You have to send the mail that would pop up to Payoneer. After doing this you would get instructions on how to go about it. Follow the step by step instructions you received from Payoneer on how to get your US bank account. To proceed further, you must have a PayPal Account. Log in to your PayPal account and register both your US bank account and your payoneer prepaid debit card with PayPal. To do this, hit “my account” from the PayPal home page. Select “my money” on the drop down menu. Choose “update” and then “add”. key in necessary details about your US account and your prepaid card. Click the “update” link at the bottom of the page to add the account details. To withdraw, click on “my account” once again. Choose an amount to withdraw to your US bank account. Click “continue”, after reviewing your transaction you can hit submit. Now your payoneer account is fully connected to PayPal. Give your funds a maximum of seven days to arrive. You can see these funds in the “my account” section of payoneer.